Aveiro is a very picturesque little town roughly 60km south of Porto. Although not directly by the sea (12km to the nearest beach), its charm lies in the network of canals that line the perimeter and the waterfront buildings which are beautifully decorated and coloured, creating a strong visual feast as you travel the water and pathways. Getting to Aveiro is a very straightforward affair and you can do so either by bus, train or car. The train station in Aveiro is situated at the eastern end of Avenida Dr. Lourenco Peixinho which is the main shopping street. The town is relatively small so nothing is more than 15-20 minutes walk from you arrival point. The train connects you to Sao Bento and Campanha every hour or you can head further afield to Coimbra B. Most buses arrive centrally so you should be well placed for a little sight-seeing. There are bus stops on Rua Comandante e Cunha which is on the left as you exit the train station. Here you can pick up express buses (Rede Expressos) to Coimbra, Lisbon and Porto but you will first have to buy a ticket from Loja das Revistas located in Praca Humberto Delgado which lies at the end of Rua Viana do Costelo (which runs on from Avenida Dr. Lourenco Peixinho). You can also use the service to reach Praia da Barra and Costa Nova. 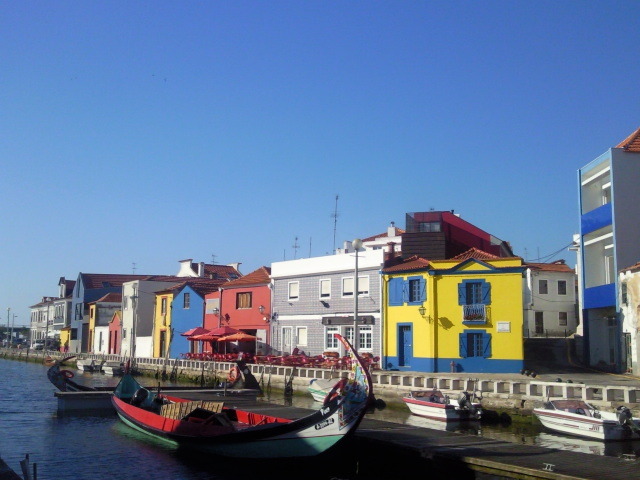 Read about Aveiro by clicking here. This entry was posted in Aveiro, Uncategorized and tagged Aveiro, Beira Litoral, getting to and from, Portugal, tourism, transport by david. Bookmark the permalink.